The centerpiece of the exhibit and Reformation Day events at Emory is Lucas Cranach’s 1536 painting "Law and Grace," which illustrates the essence of Martin Luther’s reform: the concept of salvation through God’s grace alone. The exhibit is free and open to the public during the library’s regular business hours. To register for tours of the exhibit, or to arrange a tour, please visit here. Reformation Day at Emory: "Law and Grace: Martin Luther, Lucas Cranach and the Promise of Salvation"
Oct. 27, 2016, 9 a.m. – 4 p.m.
View the full schedule. Register online or by calling 404-727-6352. Candler School of Theology’s Pitts Theology Library has been selected as one of just three U.S. sites to exhibit items related to Martin Luther in celebration of the upcoming 500th anniversary of the Reformation in 2017. The German Federal Foreign Office and four German museums chose Pitts, along with the Morgan Library and Museum in New York City and the Minneapolis Institute of Art, to take part in “‘Here I Stand…’ – Luther Exhibitions USA 2016.” These three locations will host simultaneous exhibits on Luther with items on loan from the German museums, most of which have never traveled outside Germany. The Pitts exhibit, entitled “Law and Grace: Martin Luther, Lucas Cranach and the Promise of Salvation,” opens Oct. 11 and continues through Jan. 16. 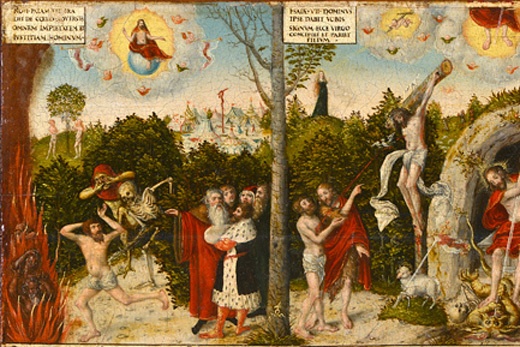 It centers on Lucas Cranach’s 1536 painting "Law and Grace," which illustrates the essence of Luther’s reform: the concept of salvation through God’s grace alone. The German team worked closely with Pitts’ staff to design the exhibit to take advantage of existing materials from the library’s impressive Kessler Reformation collection. In addition to "Law and Grace," other German artifacts in the exhibit include a spear that belonged to the palace guard of Ferdinand, emperor of the Holy Roman Empire from 1558 to 1564, and a wall fountain from the Luther House in Wittenberg, discovered during archeological excavations. In order to fully explore the nuances of "Law and Grace," the painting will serve not only as the centerpiece of the exhibit, but also of this year’s Reformation Day at Emory, which takes place Oct. 27. Jonathan Strom, associate dean of faculty and academic affairs and professor of church history, who will explore the theological aspects of the work. The day also includes a luncheon musical program featuring the Candler Singers. Reformation Day at Emory celebrates Richard and Martha Kessler’s 1987 donation of their private collection of Reformation imprints and manuscripts to Pitts. This gift has made Pitts well-known to Luther scholars, as the collection has grown to exceed 3,600 items, a number matched by only two other libraries in North America. The collection stands alone in its holding of more than 1,000 publications by Martin Luther himself. The “Law and Grace” exhibit is made possible by support from the Foreign Office of the Federal Republic of Germany, the Halle Foundation (Atlanta), and the four German “Here I Stand” institutional partners: the State Museum of Prehistory (Halle), the Luther Memorials Foundation of Saxony-Anhalt, the Foundation Schloss Friedenstein Gotha, and the German Historical Museum (Berlin).